We have been working on a MP Blueprint Project, its currently based on the MP Shootout game modeand uses the same widget/blueprint system. We integrated Steam via the .ini files and it works perfectly in the editor and standalone game mode. However it packages and cooks successfully but upon boot it will instantly crash and display no bug or error code, claiming I don't have the symbols to view it. I will attach the logs in a .rar file so they can be accessed, and hopefully someone can shed some sort of light on the matter. I have narrowed the issue down to my .ini files and its definitely related to the Steamworks implementation. I have tried to go through the OnlineSubsystems doc but to no avail, the file locations are a big vague and hard to locate the .cs files and im unsure as to whether i actually need to edit them or not; due to the my game being entirely blueprint based. Managed to fix it with a combination of this and the Doc's page, Im not sure if i had to install VS2015 for this or not. However i did create a C++ file in the project to edit the games build.cs and target.cs files, but i am not 100% sure that was what fixed it, I had some compile errors with some poorly referenced files. 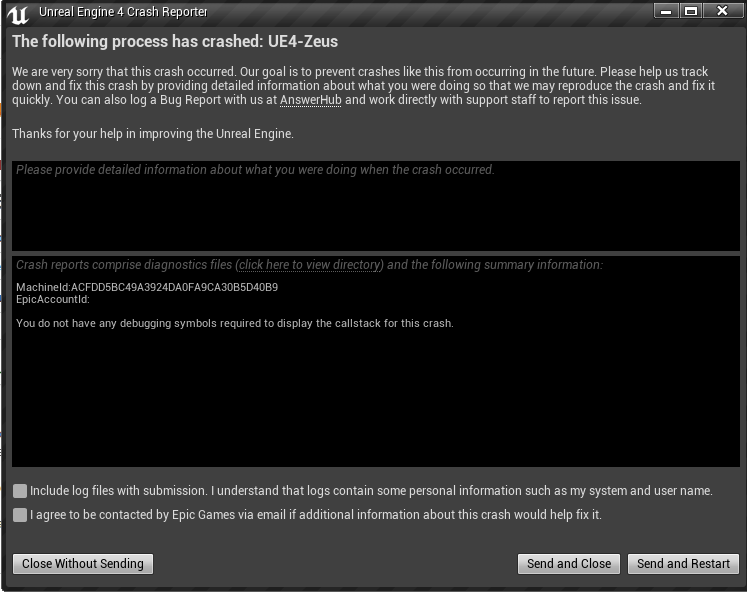 That could of possibly caused the crashes with an incorrectly labelled game instance file. How to setting up a dedicated server in Steam?